What would President Trump define as his key success criteria? He has detailed a long list of goals ranging from increased employment, faster wage growth, stronger domestic investment and renegotiated trade deals. However, the central objective of Trump’s policies is the pursuit of faster GDP growth. His economic advisors frame the objective of narrowing the US trade deficit in terms of reducing the net export drag on economic growth. His planned tax changes, repeal of regulations and easing of environmental standards are an attempt to spur domestic investment. However, it would be incorrect to view him a populist. While Trump has spoken of addressing income inequality and laggardly wage growth, as we will discuss in detail below, they appear to be slogans rather than anchors of his policy agenda. His fiscal plans are likely to prove deeply regressive while his administration opposes minimum wage increases. Understanding that Trump is not a classic populist is crucial in assessing both the inflationary implications of his policies and the outlook for interest rates. The pursuit of faster levels of economic growth is therefore the lens through which we should view Trumponomics. Trump will implement the improved coordination across reflationary levers that has been so lacking globally since the GFC. Fiscal policy will start to take the burden of driving growth, which will allow the Fed to maintain an albeit glacial pace of monetary tightening. Loose fiscal/ tight money is a positive combination for a currency, particularly since we assume that economic growth will respond to the coming stimulus. 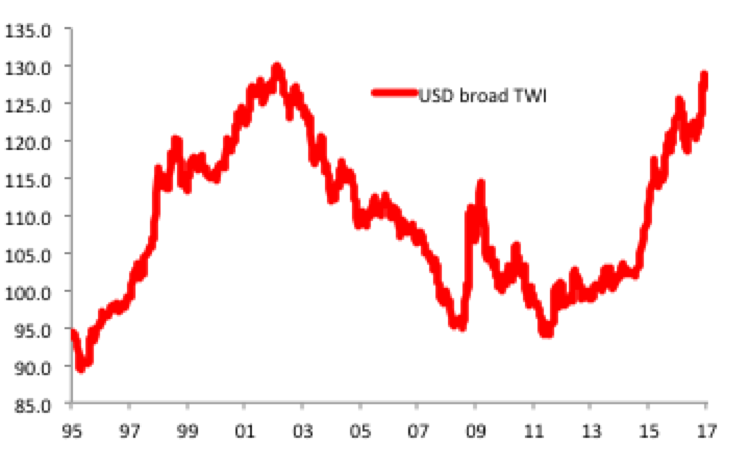 We continue to believe that Trump’s protectionist agenda comprises a potential demand shock to the rest of the world and will have the direct effect of strengthening the USD. While Trump’s focus on accelerating economic growth might lend itself to a preference for a weaker USD, such a policy would lack credibility in the context of his broader policy agenda. As Trump’s policy platform takes shape, it is timely to update and stress-test our views. One of the most effective ways to boost aggregate demand and employment would be for the government to increase public investment. This would have the additional positive externality of improving productivity growth as the US’ creaking infrastructure was improved. During his campaign Trump spoke of USD1trn in new infrastructure spending, double Hillary Clinton’s goal. This would amount to 5.3% of current US GDP. While fiscal spending would have a higher multiplier effect than tax cuts, Trump has been backing off this pledge for weeks. He has supported the GOP insistence that any spending be revenue neutral and be offset by spending cuts elsewhere. That would clearly undermine the stimulatory effect of this policy. The Democratic Party’s offer to Trump of a USD1trn package of spending plans they would support is highly unlikely to be accepted. Lower corporate tax rate. Reducing corporate tax from 35% (which is high by international standards) to 15-20%. Although as we note below, this objective may be superseded by a push to replace the traditional US corporate rate system with a quasi-VAT system. Interest deductibility. No longer allowing interest repayments to be tax deducible. This would provide equal treatment to other aspects of the capital structure such as equity dividend payments and corporate bond servicing. Companies will no longer be incentivised to fund via loans rather than by issuing debt or equity, although of course only larger firms that can access the capital markets can have such an alternative. Investment to be fully tax deducible in year one. Companies will be allowed to make 100% of fixed investment tax deductible in year one. They will no longer have to depreciate investment over the life of a project after accounting for a steady depreciation of an asset. This is a crucial step as it will encourage a pick-up in investment, especially among large companies who can channel cash-flow into fresh investment projects and hence lower their average and marginal tax rate. The Border Tax version 1.0. The Trump administration has mooted several incarnations of a border tax. We will discuss others later, but now we focus on the more complex but less controversial border tax – a switch from a production to a Destination Based Cash Flow Tax (DBCFT). This is a variant of VAT whereby companies are taxed on the location where their goods are consumed. The proposed DBCFT scheme would allow companies to deduct exports from their tax bill but not imports, thereby reversing the current situation. In essence, companies will be taxed on whether goods are consumed rather than produced in the US. An additional component of the tax is that companies can also deduct labour inputs from their tax bill. The proposal would in the first instance lower the incentive for production to be shipped overseas and lower the appeal of companies undertaking tax planning to book profits on overseas sales overseas. (On this latter point, DBCFT is therefore an additional way in which the administration could entice companies to repeal the ~USD2.5trn in US company profits held overseas.) A DBCFT based border tax is therefore viewed as a critical component of the administration’s efforts to narrow the trade deficit and encourage more production to be kept onshore. (Although as we discuss later, it’s effectiveness sin achieving these goals is questionable.) More broadly, the switch to DBCFT is likely to deliver a lower aggregate corporate tax bill. A private offset for lower than anticipated public investment? 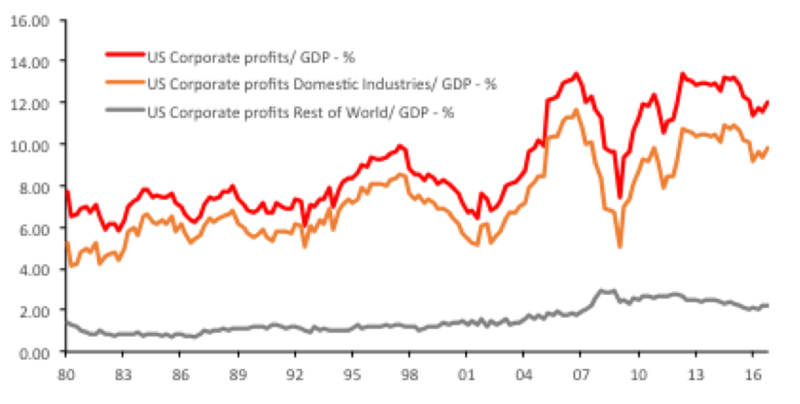 Of the major developed economies, the US has shown among the strongest recoveries in investment since the GFC. Private fixed investment measured 16.7% of GDP in Q4 2016, up sharply from the crisis nadir of 13.6% in Q1 2010. While this is below pre-crisis levels of ~18%, this largely reflects the bursting of the property bubble. 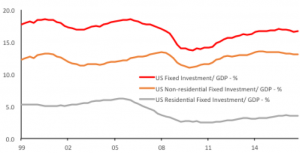 (Residential investment is 3.6% of GDP compared to a bubble peak of 6.2% in Q3 2005). 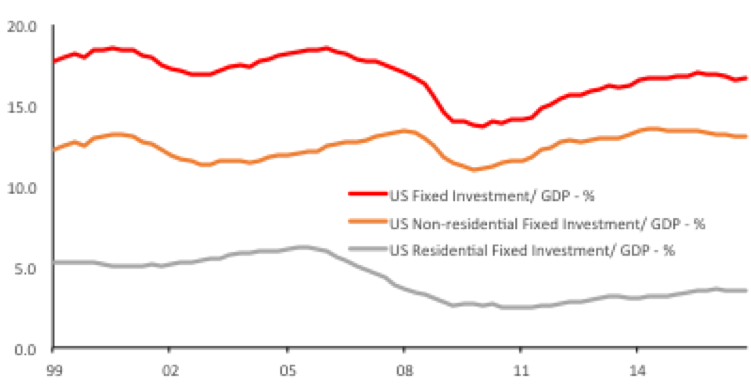 Non-residential private investment (13.1% of GDP) is already at pre-GFC levels. This would suggest that there is less room for catch-up investment in the US than is the case in other economies such as the UK, Japan or the Eurozone where the capex recovery post-GFC has been far more laggardly. While private investment would be expected to increase following the tax changes, it may be difficult to replicate the full impact of the 5.3% of GDP public investment pledge which has moved off the agenda. The scale of the investment pick-up may therefore be sensitive to the extent to which President Trump directly encourages private companies to undertake public infrastructure spending. However, the tax change may nonetheless encourage a front-loading of investment by large companies as they manage their tax liabilities, which may lead to a larger initial boost to investment. We assume that the investment upsurge may boost GDP growth relative to headline of 0.50-0.75pp over the coming 24 months. Income tax reform will be another source of stimulus. President Trump has committed to streamlining the US tax system. This will involve combining the 7 current tax brackets into 3 (12%, 25% and 33%), ending estate tax and removing some of the current tax deductions and created a larger aggregate reduction. The objective is to deliver across the board tax cuts. The plans would achieve this, although the largest reduction would occur in the higher income tax brackets. This would reduce the effectiveness of the policy since higher income earners would have a lower marginal propensity to consume additional income than individuals with lower income. Nonetheless, even with the regressive nature of the tax cut lowering the multiplier effect, the tax cuts would be highly stimulatory. Using aggregate personal income data, a 1pp decrease in aggregate income tax would – other things equal and assuming this directly passed onto disposable income and that the household savings ratio was stable at 5.7% (3mma) – boost GDP growth by around 0.25pp over a two year period after mutliplier effects were taken into account. However, one is rarely able to say “other things equal” with confidence. Other aspects of the policy will act to restrain consumption especially among lower income earners. As noted above, tax cuts will largely benefit the income cohorts with a lower marginal propensity to consume. Also, to limit the deficit implication of tax cuts (over a 10-year period, most estimates of the impact of the tax cuts on increasing government debt is USD4.5-6.0trn or 31.8% of current GDP) the Trump administration plans a series of cuts to social security and healthcare. One possibility is a repeal of Obamacare, which may run the risk of increasing the number of households without heath insurance, which in turn increases the need for precautionary savings. Other suggestions include raising the retirement age and adjusting the indexation of social security payments to inflation. The net sum of these fiscal reforms may be to crimp the stimulatory effect of the tax packages on lower income households. The analysis above suggests that Trump is not a populist. His income tax cuts are regressive, particularly when combined with likely cuts to social security. This feeds into one of our core assumptions – that the much hoped for upsurge in wages as a consequence of Trumponomics may disappoint many. Nonetheless, while the multiplier effect of the tax cuts is likely to be low it will still be positive, especially as the tax cuts are likely to be deficit financed as they were under Bush II. 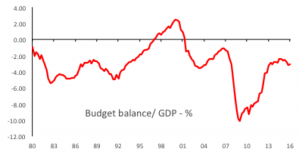 Meanwhile, government investment spending is likely to disappoint but one cannot ignore the stable stimulatory effect of the corporate tax reforms on private sector investment. In addition, DBCFT would represent a reduction in corporate tax. US economic growth will be increased by the tax plans albeit at the expense of a likely significant expansion of the budget deficit, and we assume a 1.0pp increase in GDP over a 24 month period relative to baseline. The Trump administrations fiscal plans, while controversial, are grounded in traditional economic discourse. Trump’s protectionist leanings, however, bring fringe policies directly into the mainstream. Trump’s economic advisors diagnose the loss of US manufacturing jobs and the widening trade deficit to several factors. Firstly and as noted above, they believe the current tax code incentivises production to be shipped and profits to be booked overseas. Secondly and more controversially, Trump’s advisors believe that countries have sought unfair advantage over the US by implementing competitive currency policies, implementing competitive tax policies and implementing mercantilist economic policies which artificially lower the cost of capital to exporters and impose non-tariff barriers to imports. Thirdly, the Trump team also views major trade deals signs in past decades as favouring the US’ trade partners. As with many political narratives, there is more than a grain of truth to some of these accusations. The economic model of AEJ and in particular China has seen policy-makers act to restrain currency strength for much of the past two decades, albeit the region’s current problem is mounting downside risks to exchange rates. In China specifically, it was indeed a problem when the country joined the WTO with an economic model which viewed bank lending as quasi fiscal sending and where return on capital concerns failed to prevent a continued dramatic expansion of corporate leverage. As bank NPLs can be written off while delinquent debtors continue operations, in effect many companies have experienced a close-to-zero cost of capital over the past few decades. Meanwhile, Germany does indeed benefit from the EUR and how it weakens the country’s currency compared to if it had retained the DEM. Border Tax version 2.0. The Trump administration has mooted a second variant of the Border Tax. This version is based on an analysis that foreign countries obtain an unfair advantage over the US by imposing VAT. The argument states that companies can claim back VAT when they export goods but that the US does not impose such a tax and hence companies do not obtain the same benefit. The analysis is specious as VAT does not distort trade flows as domestic and foreign companies compete in a domestic market based on the prevailing tax policy and domestic market prices. While a company may favour selling goods to the US where there is no VAT rather than selling it domestically, a multitude of other factors determine whether this is an appealing business decision: competitiveness; product quality; transportation costs. Nonetheless, Trump’s key trade advisor favours imposing a Border Tax equal to the VAT imposed domestically. This has no real theoretical underpinning and hence would likely be in contravention of WTO rules. The Border Tax 2.0 would be additive to not a substitute for version 1.0. Currency manipulation. Trump’s administration has also been clear that it feels that China is a currency manipulator, and has also accused Germany of a similar policy. There is a non-negligible prospect of China having sweeping tariffs imposed on exports to the US if it is formally labelled a currency manipulator. Trump’s desire to see outward FDI reverse and more production be based in the US means that his administration is less sensitive to the corporate lobby groups that argue that US companies that offshored production to China would be adversely affected by the imposition of tariffs. Abrogating trade deals and rules and Border Tax 3.0. The rules of the game are in flux. Border Tax 2.0 would likely contravene WTO rules. As would other suggestions that trump has aired about imposing ad hoc tariffs on countries (Border Tax 3.0), such as a 20% tariff on Mexico. Trump favours renegotiating trade deals such as NAFTA. The rules of international trade and investment flows are no longer stable. The effect of these policies would be to impose a demand shock on the rest of the world as access to US markets would be reduced. This underpins our view that protectionist policies would in the first instance see a much stronger USD. Of particular concern would be the impact of Asia ex-Japan where the region’s export led growth model is already struggling in the face of a 1pp drop in global GDP growth since the GFC. Throwing into the mix the demand shock of US protectionism would deal a potential body blow the region’s growth outlook. In essence, Trump’s protectionism would be an attempt to reverse the situation fo the past three decades whereby it has been better to be an exporter than an importer of deflation – Trump’s administration wants surplus industrial capacity to be unwound at source. The USD would appreciate to potentially offset many of the potential competiveness gains that accrue from increased tariffs. US exports will weaken as protectionist policies threaten a business cycle downturn in overseas markets. There is the risk of retaliation, although given that the US is the world’s largest consumer such policies maybe limited to a large economic region such as the Eurozone. 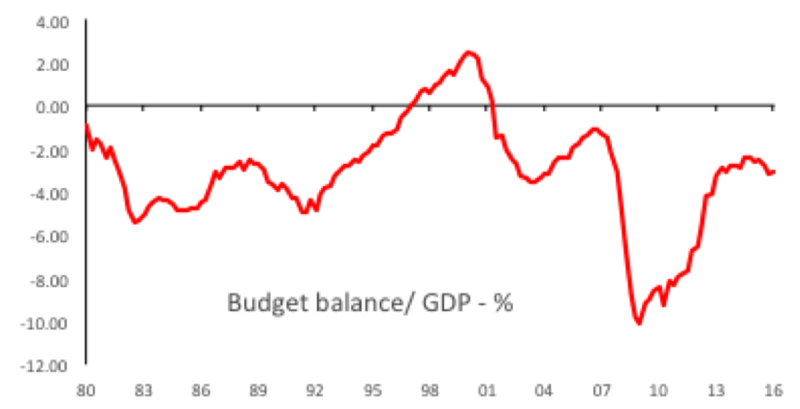 The pro-growth fiscal policies may create a business cycle upswin that exacerbates relative growth differntials. One potential volatility event is how President Trump may react is after 12-24 months, his policies widen the US trade and current account deficits which looks like a probable outcome at present. It is also worth stating that an additional source of USD strength is likely to come from increased geopolitical risks. President Trump’s protectionist leanings are closely aligned to a more isolationist political doctrine. Under the Obama administration the US curtailed its overseas involvement and influence, and under Trump that shift may accelerate. Without a US hegemon, we are moving towards a more multi-polar world geo-politically, which creates an additional risk premium that will lend strength to the USD. This is a particular concern since President Trump’s approach to diplomacy this far has been headstrong and aggressive, and does not appear to be tempered by a strategic long-game. A simple analysis of Trump’s economic platform is that it will lead to an upsurge in inflation, create economic overheating and drive up US interest rates. Being short-USTs is a highly consensus response to Trump’s plans. However, the reality is more complicated and US interest rates may already be at levels where they are a buy. The economy can run hot for quite some time. A stronger USD in response to trade protectionism would moderate the impact on US finished goods prices if Border Tax v. 1.0 or 2.0 were implemented, or indeed if other forms of trade protectionism were to be seen. The larger the trade sanctions the greater the potential impact could be on the USD. 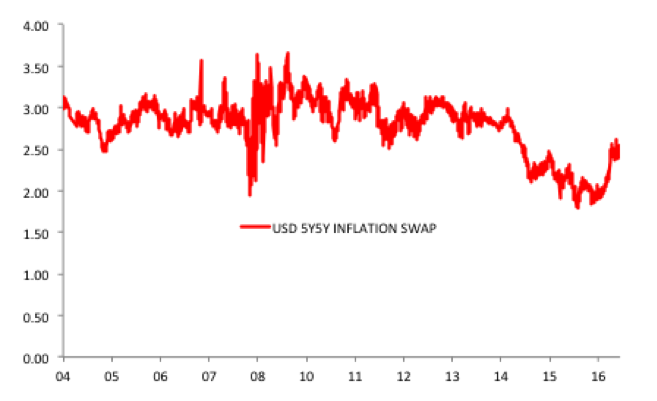 In fact, due to the potential for a stronger USD the US could be less immune to a downside risk emerging to the current global economic upswing whereby higher headline inflation (following a bounce in commodity prices) is set to squeeze real incomes. From a more medium and longer-term perspective, productivity growth is a critical driver of wage gains. 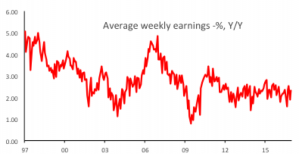 The post-GFC slump in US (and global) productivity has therefore been a restraining influence on wage growth. 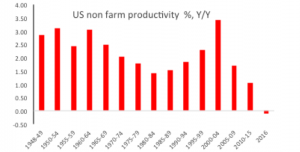 Some of Trump’s policies could potentially enhance productivity if, for instance there is an upsurge in investment activity particularly in terms of infrastructure. However, the distortions to trade caused by protectionist measures could more than offset these gains. Trump’s economic agenda is negative for medium-term productivity growth. Given that he is no populist and will not be seeking to push for higher wages as an end in itself, this does not auger well for longer-term wage growth. Our conclusion reflects our view, stated above, that the wage and inflation response to Trumponomics will be less than assumed. Our view also hinges on our assumption of the changing level of the neutral Fed Funds rate and the path of the Fed. In short, yield curves tend to pivot around a central bank’s neutral rate, inverting as policy rates move above this mark and steepening below it. (The falling neutral Fed Funds rate). The neutral Fed Funds rate has been trending lower since the crisis in response to falling trend rates of economic growth, financial sector re-regulation tightening monetary conditions and a tight fiscal policy. The neutral Fed Funds rate declined form 5.25% pre-crisis to around 1.75%. 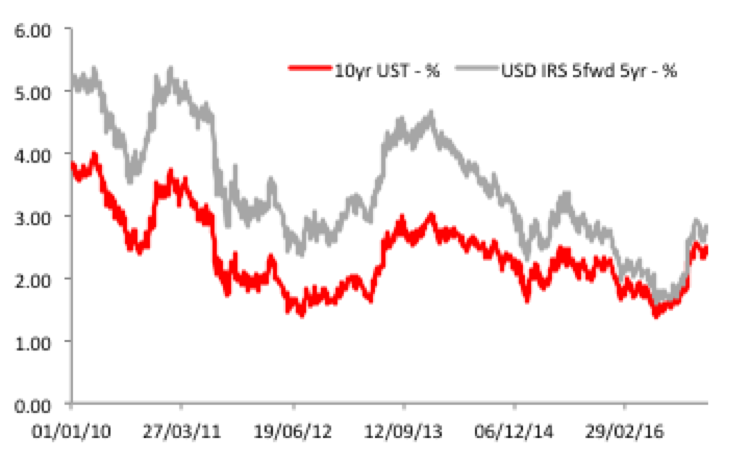 That trend underpinned the multi-year rally in US interest rate markets. However, following Trump’s election we anticipate a 100bp increase in this neutral rate to 2.75%: fiscal policy will assume a greater role in driving growth and lessen the need for currently low interest rates; financial sector de-regulation will ease monetary conditions at any given interest rate level; just as markets more broadly are moving to a new higher volatility regime, so is there reason for a positive term premium to be embedded in the US yield curve. 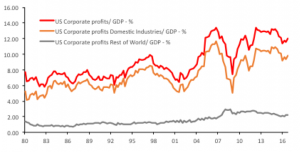 (Avoiding the Big Crunch – policies to prevent a deflationary world.) Given these assumptions we expect the current range for the USD IRS 5fwd 5yr to be 2.75% +/- 25bp, while the pivot point for the 10yr UST is 2.50%. This is despite it being likely that the Fed takes many years to put the Fed Funds to 2.75%, with just 1 hike anticipated in 2017. Talk of 4+% 10 yr UST yields seem fanciful as unless there was a dramatic rise in the neutral policy rate this would represent a dramatic tightening of monetary conditions which would ultimately prove self correcting. Chart 9. The pivot point for the US yield curve is likely to be 2.75% – and we are already there. Despite the likely absence of public infrastructure spending, we still anticipate President Trump’s tax reforms to lead to a notable pick-up in economic growth, with a 1.0pp increase relative to baseline over the next 24 months. We would argue that interest rates have already risen to levels that compensate for the risks of faster growth and are biased to scale into long UST/ received IRS positions. Meanwhile, the USD is correcting in light of the concerns raised by Trump’s somewhat chaotic first fortnight in office, by the public calls for a weaker USD and by the fact that an economic policy shift had been somewhat priced-in but will clearly take time to materialise. Nonetheless, due to the unfolding policy mix and likely eocnomic growth response in the US we would look for levels to buy USDs particularly against Asian currencies who stand as particularly vulnerable to a reversal of globalisation. We continue to favour structural long USD/CNY NDF and long USD/KRW positions – see The weak CNY and the potential for a trend acceleration and Korea – the path to zro interest rates. Chart 10. The USD is poised for fresh gains over the coming quarters as the impact of Trump’s economic agenda is felt, reflective of how we have entered a new volatility regime. Indeed, a stronger-USD and recently increased USD yeilds are a poor backdrop for emerging markets more broadly, and renewed focus may be brought to bear on pegged/ commodity currencies. (Can the Saudi Arabian FX peg persist in a world of diminished OPEC relevance?.) In contrast to these posiitve convexity trades, the current climate also increases the appeal of placing within portfolios trades that are non correlated and somewhat immune to the vicitudes of US trade policy, such as our bias to be long the ARS as the country adopts a clissic stabilisation plan and returns to economc corthodoxy – Argentina and the ARS trade- Can president macri resist the siren call of populism?. Given the risks of trade protectionism and increased geo-political risk, a USD over-shoot may be on the cards, despite President Trump’s natural bias for a competitive currency. Longer-term however, the sugar-rush phase of economic growth is unlikely to last. Trump’s policies may exacerbate the problem of an income-lite recovery that has characterised the global economy since the GFC. A protectionist policy platform is also not a medium-term positive for economic growth. However, for now the policy framework supports stronger growth and ultimately a stronger USD: as hard as it may be, we need to try and play the ball not just the man. This entry was posted in A Threatened Washington Consensus, Downside Inflation Risks, Emerging Markets, Event Risks and Left Tail Events, Fiscal Policy Activism, Income Lite Recovery, Opportunities and Right Tail Events, Regulatory Impact by Des Supple. Bookmark the permalink.